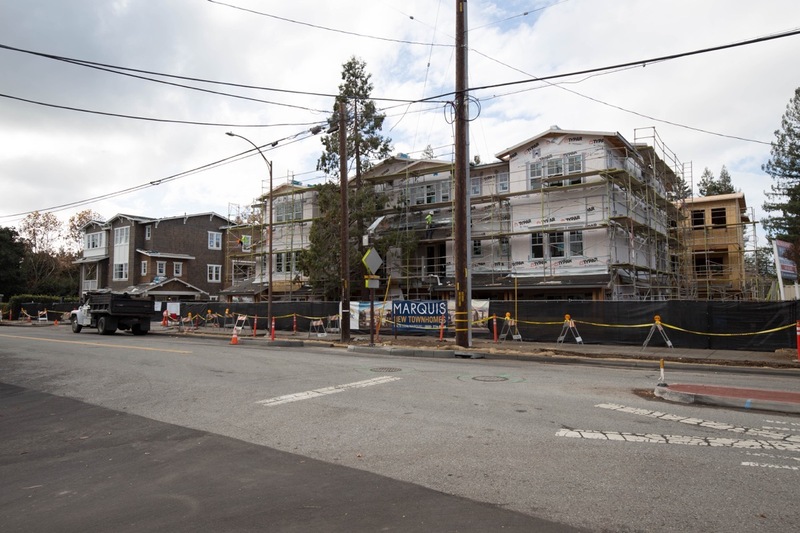 Some time ago — I was a bit surprised to realize that it was more than a year ago — I wrote a post called Southern Developments that described the various development projects then in active development in Menlo Park. Because my wife and I continue to drive for Meals on Wheels, and because the kitchen where the meals are prepared is in Menlo Park, I continue to make the weekly drive between Redwood City and Menlo Park. As I do, I keep an eye on the projects along El Camino Real (which is the route I take). Since I wrote that blog post, a couple of the projects I wrote about have made significant progress. 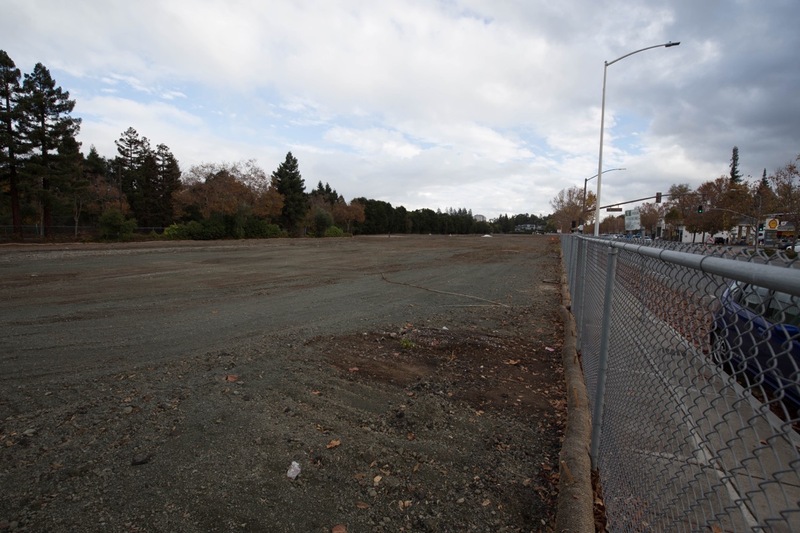 As well, Menlo Park has approved a couple of new ones that are now getting started. 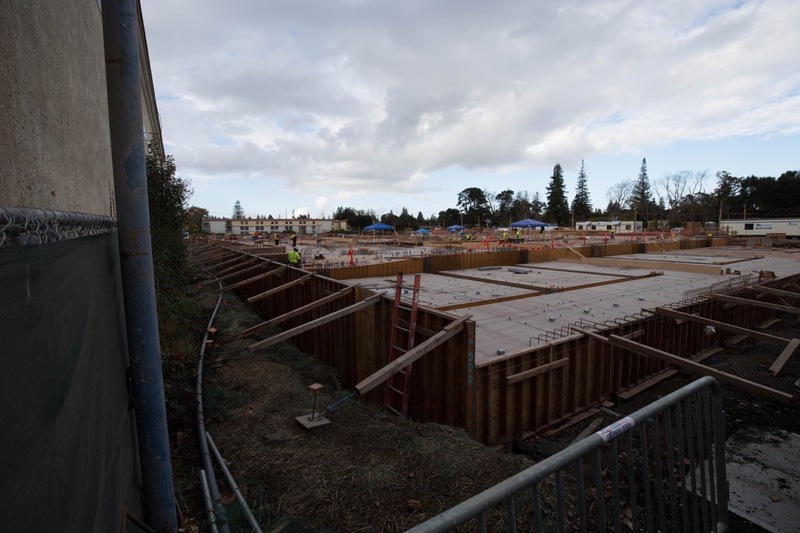 Thus, this week I thought I’d once again dedicate a blog post to Menlo Park and the numerous development projects that are currently underway in that city. It appears that the project changed hands: originally it was to be built by Hunter Properties, which likely explains the delays in construction. In any case, the project we have today, as you can see if you look closely at the sign, is being built by Pulte Homes. The project itself is called “Marquis”; you can find photos and pricing on the Pulte website. In short, though, the project consists of 24 townhouse-style condominiums grouped into seven buildings. Twenty of the condos will have four bedrooms each, while the remaining four will be three-bedroom units. All will have garage space for two cars. Prices range from $1.95 million to $2.16 million, and as approved three of the units were to be affordable — and I presume that the original agreement for those affordable units is still in place. As you can see, the units are well on their way to completion. One building — the one to the immediate left of the condo complex’s driveway — appears to be complete; presumably that will be the “model” that prospective buyers will tour while the remaining buildings are being completed. That particular building contains four of the complex’s condominiums. The old one-story retail building, which you can see in the above picture, will soon be torn down, to be replaced by two buildings: a two-story, “non-medical” office building along the front of the property, and a three-story residential building sporting 27 units along the back (which will face onto San Antonio Street, a street which parallels El Camino Real and runs along the back side of the property). Beneath both buildings will be a large underground parking garage accessible from a driveway off El Camino Real. Clearly, this project has a ways to go. 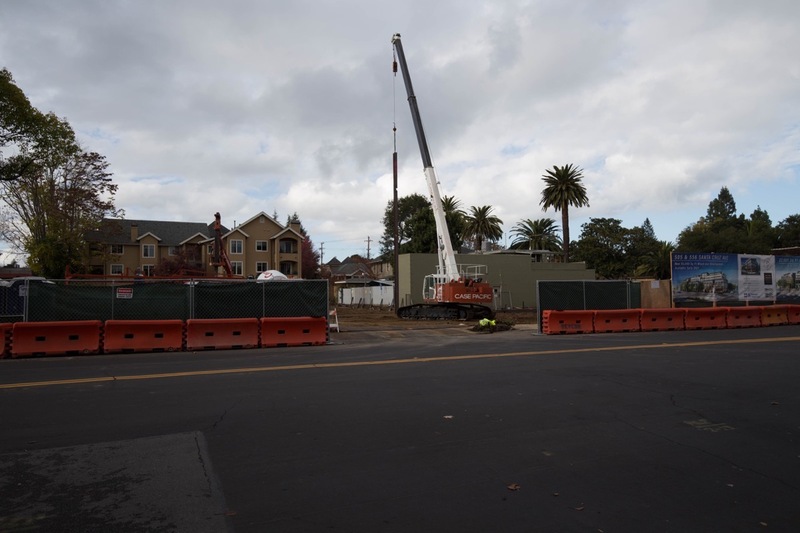 Across the street from both of these two projects is the site of one of Menlo Park’s largest projects directly on El Camino Real: the Station 1300 project. Slated to bring 220,000 square feet of commercial space and 183 apartments (a mix of one, two, and three bedroom units), this project sits on a giant 6.4-acre site. The complex will consist of three separate buildings and a large multi-level underground parking garage that apparently spans almost the entire site. The commercial space will be mostly non-medical (you have to wonder why none of these projects allow medical) office space, but there will also be roughly 19,000-30,000 square feet of “community-serving” space: a mix of retail, restaurants, financial institutions, and service businesses. Given the size and complexity of this project, I don’t expect it to be complete next year; it’ll be at least 2020 or 2021 before we see this one open to the public. 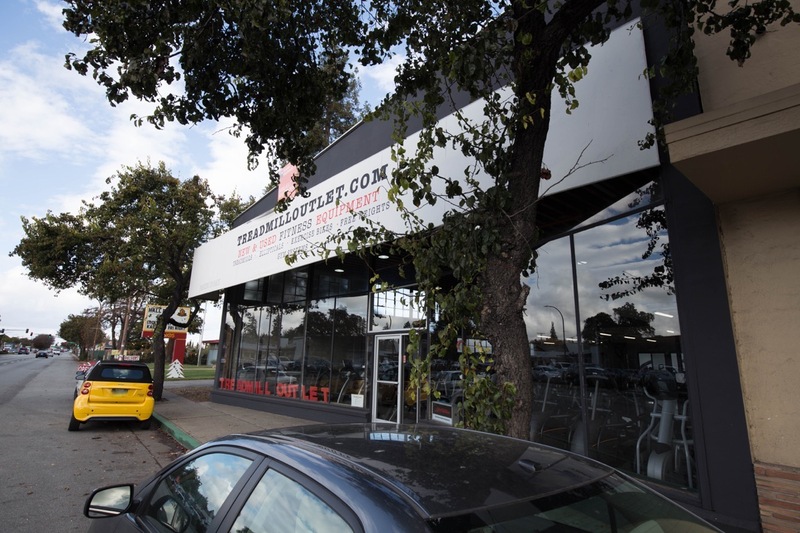 But Station 1300 is located very close to Menlo Park’s Caltrain station, making both its residential and its office spaces very attractive to commuters. 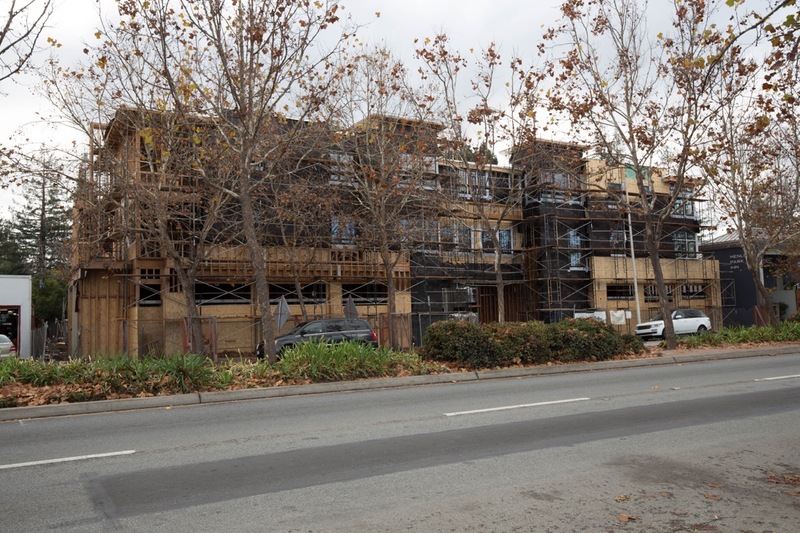 This project actually sits on three separate, adjoining parcels: 1125 Merrill Avenue, 510 Santa Cruz Avenue, and 556 Santa Cruz Avenue. Interestingly, the three parcels are not being combined. Instead, three mixed-use buildings are being built, one on each parcel. Each building will have housing on the upper one or two floors, for a total of nine. The Merrill Street building will have non-medical offices on its first and second floors. One of the Santa Cruz Avenue buildings will have a café on the ground level and non-medical offices on the second and third floors. 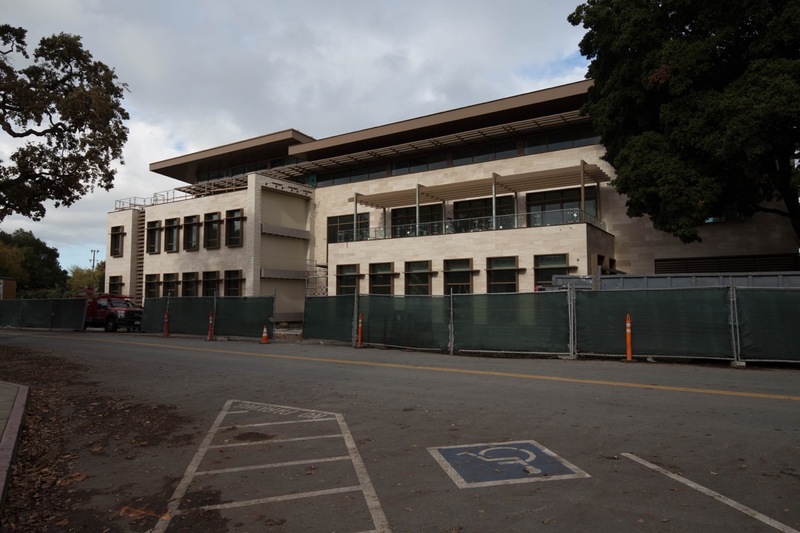 The other Santa Cruz Avenue building will have retail on the ground floor, and non-medical offices on the second floor. Parking will be either on the ground floor (behind the retail or office space) or in an underground garage (beneath the café); all would use mechanical “puzzlers” (see a demo here) to stack the required number of cars in the rather limited available space. It’s a very nice looking building, and a very “green” one as well. I’m still curious to see the “public plazas” that this building will include; from looking at the plans they are really just small patios that sit between the building and Alma Street (one of them serves as the entrance to the building). There is supposed to be a “coffee kiosk” on one; I’ll be interested to see how that goes. Certainly, once the construction fences come down I’ll head down there and see how comfortable it is for a member of the public to enjoy those plazas. With demolition complete, construction is scheduled for early in the new year (2019) with an estimated completion date of late 2020. 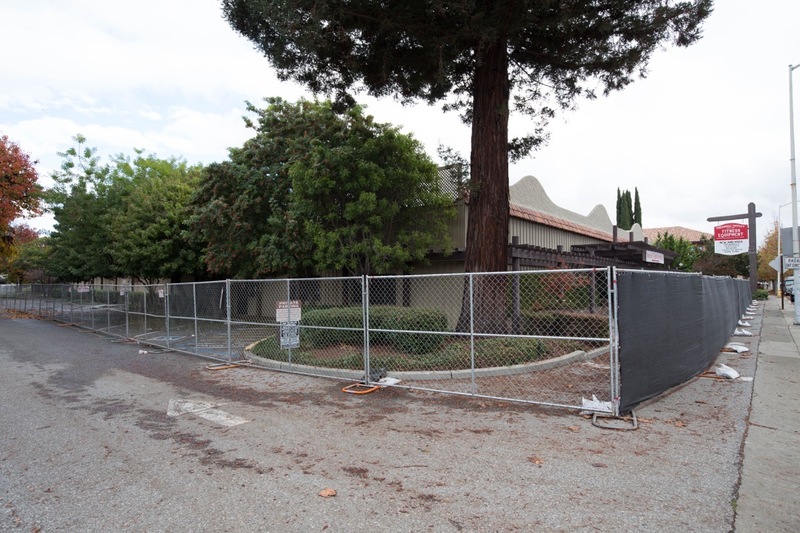 As a reminder, Stanford will be building three non-medical office buildings, 215 for-rent apartments and a large public plaza with a 10,000 square foot cafe/retail facility on the 8.4-acre site. 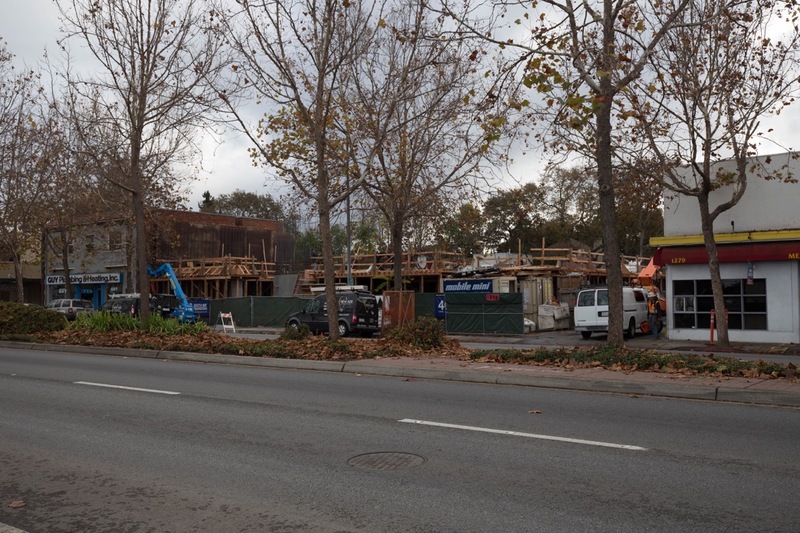 Development-wise, Menlo Park has a lot going on right now, and this isn’t by any means the end. There are a couple of more projects in the pipeline: projects that I’ll report on if and when they actually get underway. 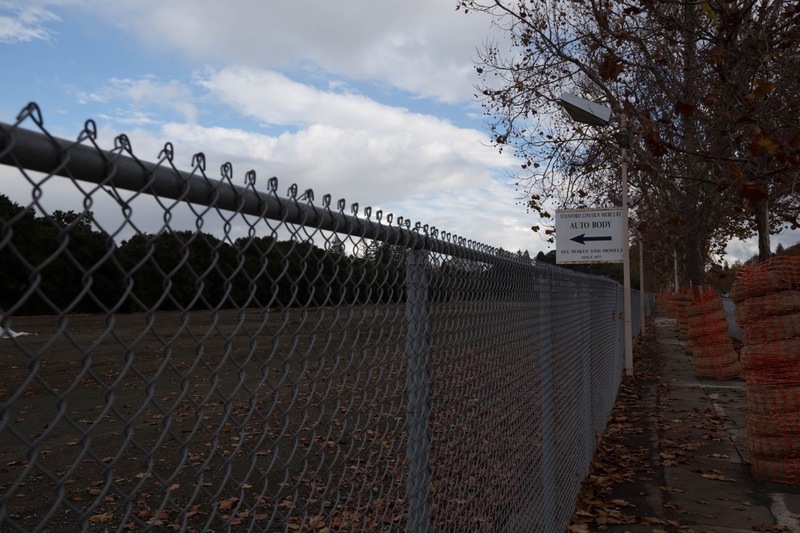 For now, though, I hope that this helps you understand just what is going on behind all those construction fences both along and near El Camino Real in Menlo Park. w. apologies for duplicate posts! As a Menlo Park native, those of us who would like to avoid turning ECR into more of a faster-moving “traffic sewer” than it already is have prevailed thus far. Walking (or even just being) on sidewalks without a parking strip buffer would be dreadful (louder and more dangerous), with cars, trucks and buses whizzing by at 30-40 mph only a mere foot or three away from the edge of the sidewalk and peds, and with little or nothing to prevent a distracted or out-of-control errant driver from driving up onto the sidewalk and injuring or killing anyone there, splashing them on rainy days … Imagine if you were a Menlo Park resident who enjoyed (or aspired to) walking around downtown and along ECR and patronize shops along there (or letting your kids do so) and/or had a business on ECR. As for the wasted opportunity for housing more people on less land, Menlo Park could (and should) look to RWC. It’s all fine and great for very comfortably-housed affluent armchair land-use “planners” (or litigants) to rail against lower-cost/higher-density “dregs” when referring to much-needed and fine-looking housing that many need and want (classy! … echoes of DJT’s “shithole countries”? ), but people-housed per acre (and per dollar) for the Marquis (former Roger Reynolds Nursery site) or Station 1300 project will pale in comparison to the efficiency/sustainability (and affordability) of Redwood City’s ECR / Franklin St. corridor TODs. We can’t (and shouldn’t) all aspire to be elite Menlo Park (or Atherton) NIMBYs. Sad! Station 1300 and Middle Plaza in MP are excellent examples of thoughtful mixed-use development near transit. What’s it going to take for RWC to get something similar instead of the dregs being peddled by Greystar? The Grerystar project for the area includes Towne Ford, Main&Elm and the roller rink will bring 3,000 jobs and only 272 housing units to an area of the City already pummeled by development and unable to handle that huge influx of people. What’s it going to take to send Greystar back to the drawing board — a new Council perhaps? The RWC high-density projects provide much needed transit-centered housing for the population of our city, allowing working families to continue living and working in RWC. As a home owner, I am thankful our city leaders put our residents’ interest over single-issue activists that want to turn RWC into a museum of 1960s that never was. Living less than two blocks from the ‘dregs’ I much prefer having human neighbors instead of an abandoned lot, 2 city blocks of chain linked fenced dealership parking, rusted metal shed and a closed rink. If you actually walked from Mt. Carmel to our part of town, you may get a chance to see it for yourself. 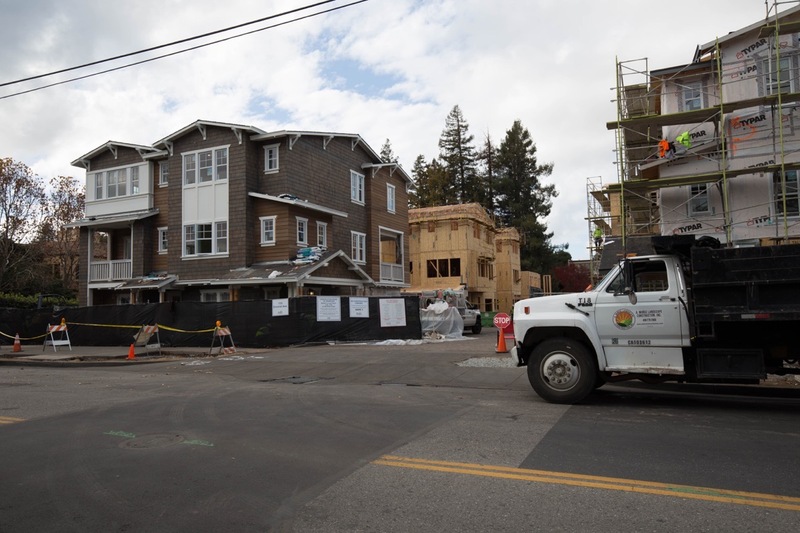 Great summary of the developments along ECR in Menlo Park. There’s so much activity going on, as it is in Redwood City. Every time one of these developments comes up for public discussion, traffic congestion is one of the biggest negatives. It seems the developer always says they will limit the office space to non-medical purposes because a medical office generates many more car trips throughout the day. That may be true, but the whole collection of added office space is still going to add to the already congested rush hour traffic along ECR. These office workers, if they don’t take Caltrain, will still need to drive their car from ECR to 101 or 280, along residential streets like Willow and Marsh. I wish there was more residential space and less office space in these new developments. I think residential traffic is spread out more evenly during the day & night, whereas office work traffic is concentrated around rush hours. I’d also like to see ECR widen to 3 lanes each way in Menlo Park, between Valparaiso/Glenwood Ave and Middle Ave. It’s a bottleneck there, as you’re trying to get from RWC to Palo Alto or the reverse. I know that means removing some parking spaces in front of some retail stores, but customers can still find parking behind the establishments. Now, I hope all this new activity will help make downtown MP more vibrant at night. I would like to see more eating establishments go there. Thank you again for the great summary and the opportunity to give my two cents worth. > I’d also like to see ECR widen to 3 lanes each way in Menlo Park, between Valparaiso/Glenwood Ave and Middle Ave.